Volkswagen has announced that the 1.5 millionth VW T2 has come off of the assembly line. 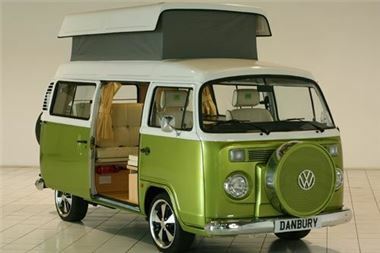 The VW T2 is an iconic vehicle at Danbury motorcaravans in the UK . The much loved VW Bus is symbol of the Flower Power generation, the surfer dudes, and an overall good time. The Volkswagen T2 began production in Germany around 1950 and become very popular in the U.K and U.S. during the 1960s. And boy, did people have a blast with the Bus – transforming them into pickup trucks, campers, and to this day having conventions to celebrate the glory of the Bus. The 500,000th VW T2 was built in 1977 and the one millionth VW T2 was built in 1995. Over the years the VW T2 has received some modern updates. Most notably in 2005 the type 1 air cooled flat four was replaced with a modern water cooled straight four. The new engine allows the VW T2 to run both gas and ethanol fuels (bio fuel). Danbury motorcaravans also offer an LPG conversion making the vehicle TRI FUEL. Power steering and air conditioning are also new options for Danbury customers for 2012. What is greener than a vehicle that has barely changed in 60 years? Danbury Motorcaravans - Home is where you park it.